It has been almost two weeks. On Tuesday the 5th of July, I was sent on sabbatical. I say, “sent,” because I probably wouldn’t have chosen to do so if I wasn’t encouraged to do so by my elders and staff. In my mind, I always pictured the pastor who goes on sabbatical is a pastor who is spent, tired and worn out. He is the pastor who is at the edge of falling apart and can’t see straight because the burden of ministry is straining his spiritual life, his family life, and his personal life. He is a pastor who can’t stand seeing another “sheep” unless it has been prepared in the kitchen and served on a plate. He is the pastor who can’t come up with anything good to preach and only opens his Bible on Saturday night when he is cramming for “yet another sermon.” He is the pastor who is romantically involved with his secretary and hasn’t been intimate with his wife for years. He is the pastor who is going bald from stress and doesn’t sleep a full night without pills or alcohol. I am not that pastor. In truth, I feel like I am in the middle of a most beautiful time in our church, Epic Life. My relationship with our church family is great, I still feel creative, I love preaching and encouraging and leading. I am not worn out or not getting enough sleep, or stressed and balding, and my wife and I are enjoying a very sweet season in our marriage, this 25th year. I enjoy a good beer but believe in the beauty of one at a time. The truth be told, I don’t think I “need” a sabbatical. But…here I am. I am finishing my second week of a two and a half month sabbatical. I have mowed the lawn two times, made two yard games, made a apple cider press, repaired my windblown fence, made a compose barrel, made a swing, cleaned my garage, split some firewood, pruned the trees in the back yard, shared meals with friends, welcomed guests in our home for a couple nights sleep, hiked Mt Rainier, paid bills, helped the neighbor and played many games and took many walks with my boys and wife. Now what? What am I suppose to be doing?… I am studying the book of Isaiah, reading a book on discipleship, a book on creativity, a book on church planting and a healthy dose of Calvin and Hobbes, and keeping a pretty cool list of creative ideas. Tomorrow I will be mowing my lawn for the third time. My first job was mowing lawns around the small town of Grangeville, ID; a town nestled in the foothills of Mount Idaho. My dad gave me the truck when I turned 15 and taught me how to take care of the equipment so I would actually make some money. I really enjoyed mowing lawns. I think I enjoy mowing laws for the same reason I am a knoller, I like things to look symmetrical or creatively unsymmetrically symmetrical. As I mowed eight yards a week it didn’t take long for a phenomenon known only to the mowing world to take place – the dull blade. Phenomenon – because the blade is sharpened hardened steel and it is being dulled by grass. Grass. How is this possible? I don’t know the answer to this deeply philosophical and deeply spiritual question, but I certainly can draw a life lesson on sabbaticals from it. A lawn mower blade starts out sharp and cuts grass like a hot knife cutting warm butter, but over time and many, many, many blades of grass dulls the sharp edge. It happens slowly and isn’t really noticeable for a long time, until you look closely, and realize the grass is being thrashed and whipped not cut. A little look under that mower brings a realization the blade is so dull it probably couldn’t even cut soft butter. What does it need? Sharpened. How does it get sharpened? It has to be removed from the mower set on the work bench and pressed into the grinder. The grinder literally takes some of the steel off the blade as it sharpens. There are four things I want to focus on, although I could write a book on this analogy. Realize – A dull blade isn’t a statement on the quality or function of the lawn mower, it is but a statement about the blade – it needs to be sharpened. Often the blade is not sharpened because it is out of sight and since it is not readily seen or accessible it is left as is, which means it will only get worse. The mower itself often works just fine, but if the blade is left to get more and more dull the nicely mowed lawn will look worse and worse and the entire mower will be to blame. It would be silly to throw the mower away and buy a new one just because the blade needs a bit of sharpening. A sabbatical allows for a bit of sharpening to happen, even though things seem great and may even be great, sharpening is still such an important part of ministry life and is very hard to do while going full throttle. Ministry is unlike mowing lawns in that when I was finished mowing a lawn I wouldn’t think about the lawn for at least a week. Can you imagine mowing a lawn for 24-7-365? The mower will die pretty fast. Ministry is like that. There isn’t a break from the work to be done, and even though I love it so much, I am pretty sure I won’t be able to keep the pace going forever. The mower will wear out. Pastors and the churches they minister with need to Realize a sabbatical needs to happen when the blade needs to be sharpened, not when the mower needs to be replaced. Sharpening a blade is pretty worthless if the mower has gone on to the great yard in the sky. Separate – Pretty simple here. To sharpen a blade, it needs to be separated from the mower. Separate means to keep apart and divided. Honestly, I have to force myself to do this. I love the church community I get to minister with. But I also am being reminded by scripture that being separated is overwhelmingly important. Jesus never once told people he was tired of them and needed to get away from them, but he did separate himself from the life of ministry. I must withdraw to the wilderness. Which means, I will not be answering emails, texts, messages, phone calls or posts. I might not even answer the door. I am forcing myself to be separate. Unless you are dying, and even then tell Averi first and she will decide if I need to know. Jesus went to the wilderness while the people he ministered to and his friends he loved continued to live, suffer, hurt, work, worship, celebrate and die. Sharpen – The blade needs to be pressed into the grinding stone to remove the dullness bringing a newly sharpened edge. I need to be sharpened as well. I don’t know what this looks like yet, but part of it has been being home and working on projects I have put off for years. I will be sharpened by learning from mentors, books, the Word, etc. This sharpening will be a blessing to the church community I love, just as the sharp blade will now “minister” to the lawn, creating a beautifully manicured lawn. Return – The “sabbatical” of the blade is only good if it returns to the mower and the lawn. And, if the separation and sharpening have been effective, the return will cut a beautiful lawn. I am forced to assume that Jesus’ Sabbatical exits were just what he needed to continue to do what he was called to. For if we are living a life of the called we are living a different life than one we would have chosen for ourselves; that life requires Sabbatical. I am trying my best to faithfully steward Sabbatical by not continuing to cut the grass with a dull blade. In this sabbatical season, I will be forcing myself to be separate, not because I want to, but because I need to. If I don’t respond to requests and communications, it’s because I have been separated. I will continue to post a few Instagram and Twitter thoughts, which get shared with FB, but I won’t be checking in to see who “Like” those posts. I will separate, be sharpened and then may I return fully sharpened and equipped to mow the lawn of life well. Luke 14:12-14 shows Jesus sitting at a banquet prepared by a religious leader. Jesus starts a discussion about who the leader could invite to his next dinner. He tells him that maybe it would be good idea to not always invite those whom he knows will return the favor and hence keep the circle of recognition going: ie you invite me, I invite you, you invite me, I invite you. Maybe instead it would be a great idea to invite those who can’t pay you back…you know…those people who are poor, homeless, lame and just not part of the high society. I have read over this passage several times and actually have preached on it many times too. But this time God opened my eyes to see something that carried much more weight than I had seen in the past. Did you catch what he was saying. Jesus was basically saying that when you premeditate a banquet, when you think a month earlier that you will be hosting a meal and sending out invitations and then going out and buying the food and preparing the meal. When you set the table and pick out the wine. Do this in such a way that you are preparing the table for the elite crowd you usually invite, but don’t invite them. Prepare the meal, pick out the wine and set the table with creativity and thought and your finest, even when you are inviting those who cannot pay you back. Do we do this? When was the last time you were serving at a soup kitchen for the homeless and the table was set with the best crystal and china and silverware? Whenever I have been involved in serving the down and out we get out our best paper plate, paper cups and plastic forks set on a clothe-less picnic table in a non decorated cement floor room where the servers are standing behind the counter slopping the meal onto the plates as the marginalized shuffle through the line and sit alone but together on the bench seats where only “they” are relegated to. I know we don’t mean anything bad by this treatment…but I don’t think what we are doing is what Jesus had in mind. The next time we serve our community at Epic Life Church, in the Garden or at One Cup, let’s bring out the best we have and “host an elaborate meal” in Jesus’ name. 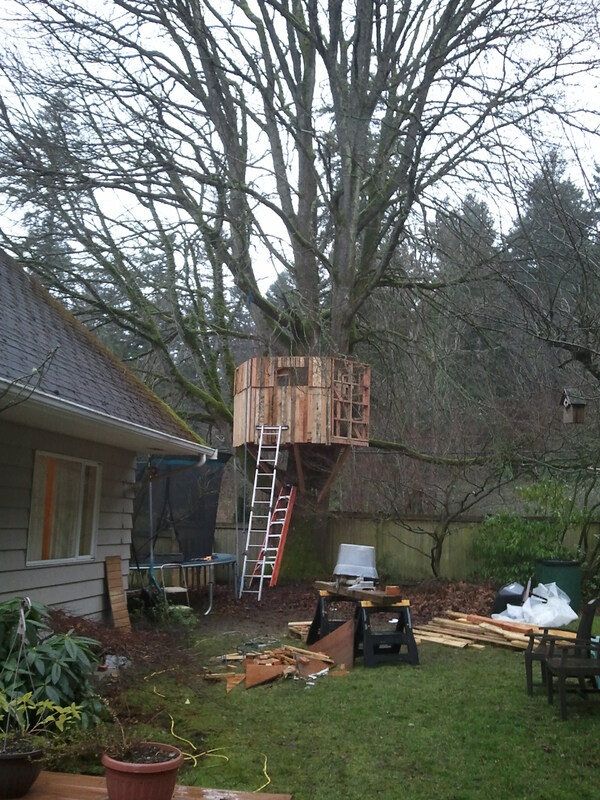 We have continued building the Tree Fort on into day three and things are going quite well. the neighborhood kids have discovered the great imagination station perched in our tree and there has been quite a bit of running up and down the ladder, zig zagging through the construction zone. My youngest two have been tossing, “Can I help Dad?” over their shoulders once in a while, but never really pausing long enough to put hand to thought. If you look closely in the next picture you can see Kaleb standing in his favorite spot…the far corner just under the Eastern window. I know they truly want to help with the building project, although mostly they want to get a hammer in their hands and hit something repeatedly until that certain something breaks. I really want to include them in the project too…for this is one of those things they will always remember and probably try to replicate with their own offspring. But, putting a seven and ten year old to work is quite a daunting task. Do I send them up the eight foot ladder standing on the top wrung with the drill and with one hand holding the screw and board while maneuvering the other hand in place to drill the screw in while hanging on with one foot? Don’t think so. But I did find some things for them to do and feel like they were putting some time in, enough to tell their friends that they built it with me. The West wall is sided. Sometimes I think I feel like I imagine my kids feeling when they ask me if they can help. Probably deep down they know I am not going allow them to use the power tools or climb the ladder to the top or do any serious measuring. I’m not sure they know I am letting them do things they really can’t mess up, things that I can double check without letting them know. I ask those questions of God often. “Can I help?” “Can I be part of showing your power?” “Can I lead someone to you?” “Can I lead a big church?” “Can I, huh, God, can I?” Like a little kid I bounce around hoping he will pick me to help in bringing his Kingdom to Seattle. Wishing and dreaming that he will let me do something important that transforms Seattle. I wonder what he thinks? Maybe he gives me tasks that he knows I can’t screw up to bad. You know like I do with my kids. 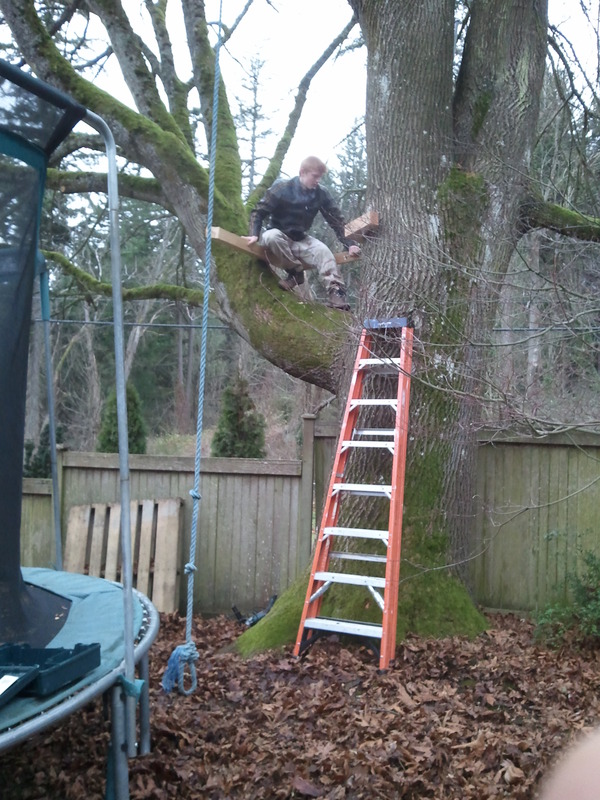 I am not going to trust them install the 4×4 braces, that hold up the entire fort, with 8″ lag bolts sunk into the tree. Well, not yet anyway. But with a bit of instruction I can entrust that to my older two boys. Of course that all depends on how they follow the small instructions. If they do the little things completely wrong because they couldn’t even have enough self control to listen and learn, then I’m not giving them any greater tasks. Hmmm. There seems to be a parable in here somewhere. Maybe our desires to do great things must match up with our humility to be taught; to be instructed; to be built up, which requires that we are torn down first. Maybe God really wants to call on me to do great big things, but he is waiting for me to be great in the small things. Maybe God is situating Epic Life Church, testing our resolve, our submission, our humility in the small things as he prepares big things. Or…maybe he already has us doing great big things but we see them as insignificant. Are lives transformed and reconciled to Christ insignificant? I think not. As I drove out of the AXIS parking lot, after an amazing Christmas Eve service, I felt this strange since of “Whew” spread over me. I was entering a three week vacation/sabbatical. It has been full tilt Go! for about three years. But you will never hear me complain. i love it and I really am not one to sit down and do nothing. In fact, the next few weeks is going to be a lesson in sitting and hearing God. 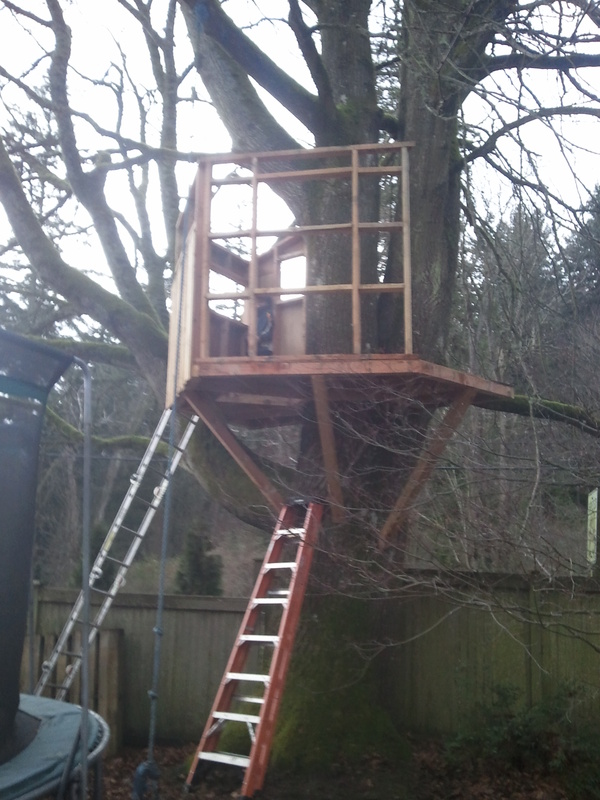 For a while now I have told my boys I would build a killer tree fort on the first limb of the huge maple tree in our back yard. And by huge I mean fifteen feet in circumference at five feet high. 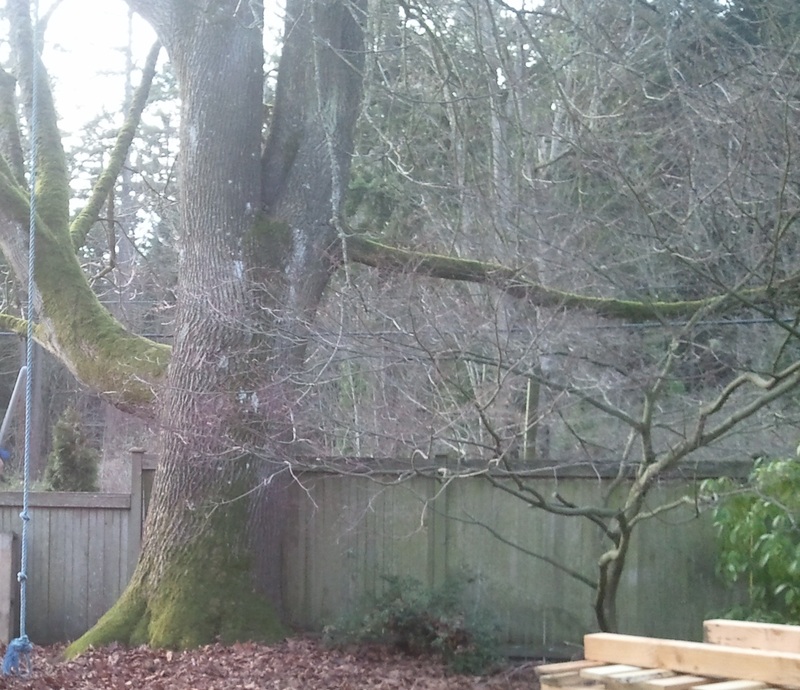 (That’s the distance around the trunk of the tree, which is somewhere around five feet in diameter.) So this is the week to do just that. If you know me well, I am a builder by design. So every once in a while I get this itch to build something with my hands. One thing you must have to enter into a project like this is, time. Well this week I have some time. 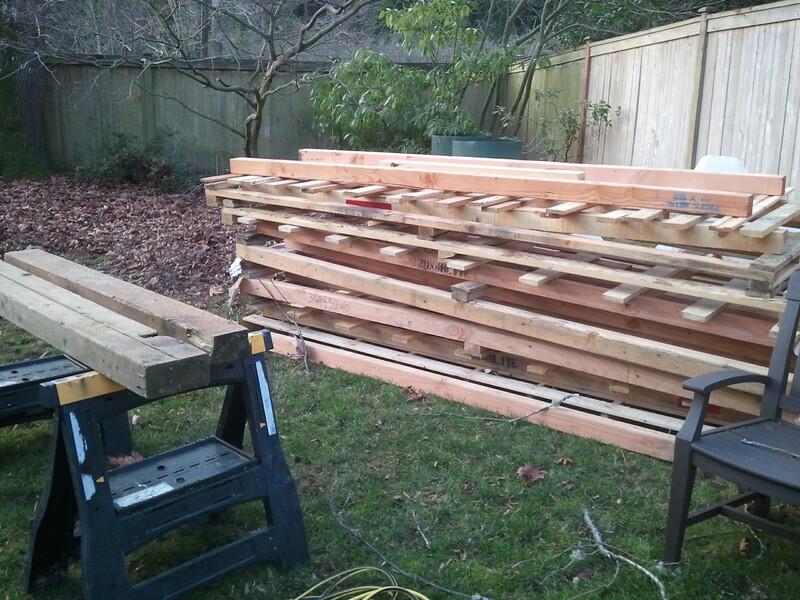 With the help of a great friend, a one Aaron Schwartzenbart, and his truck and the unasked borrowing of a certain other friend’s trailer, (thank you Jeff Campbell), I scored about three hundred dollars worth of lumber from a local sheet metal company’s left over pallets. Their trash became my tree fort project. So it was set in motion on Christmas day; after a great breakfast from my dear wife, the opening of several neatly wrapped presents and the interaction of said presents, my boys and I set to the task of breaking the pallets down into stacks of usable lumber. 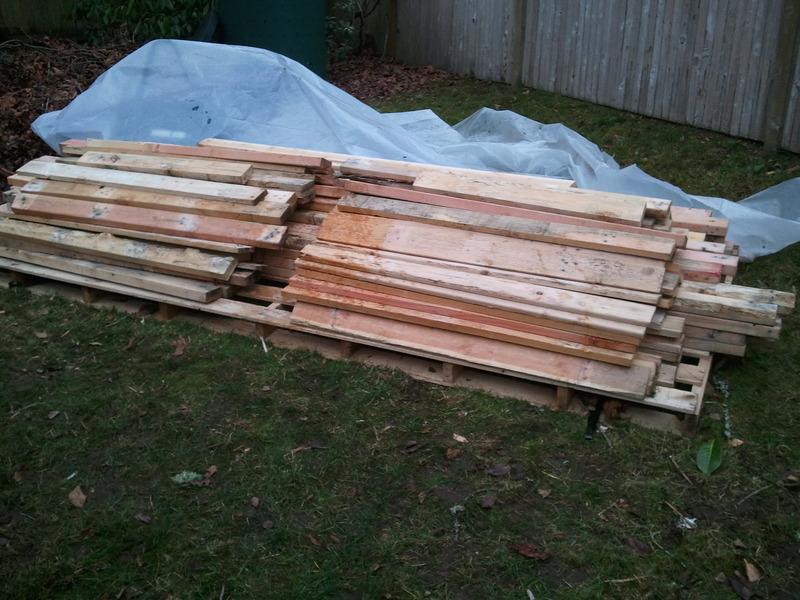 Lumber that ceased be exist in the form of pallets. 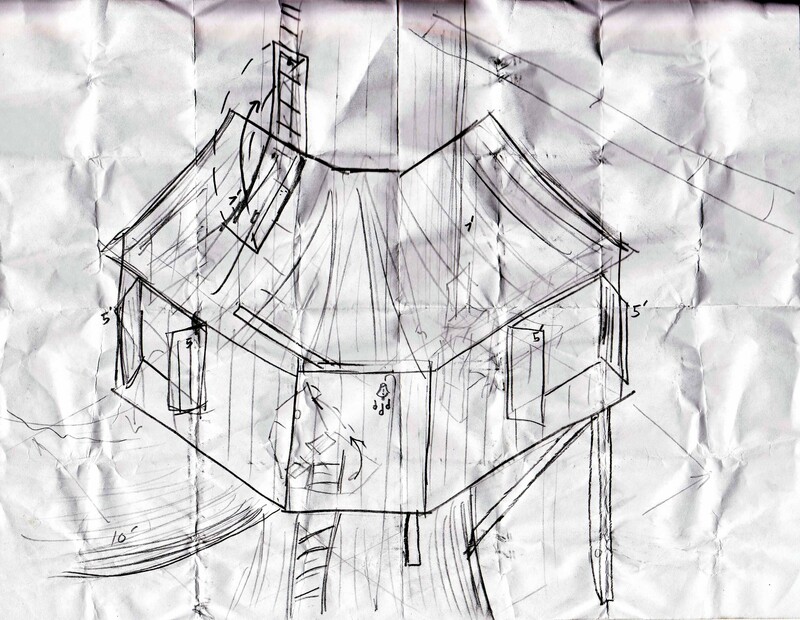 I had drawn up a sketch of what the tree fort would look like a few days earlier with my youngest son Kaleb. At seven years old, he is going to benefit the most from this project, so he got to help me draw it. He was bouncing around with excitement as we drew it and dreamed. We all need some imaginative dreaming of forts in trees don’t we? One of my degrees out of High School, many moons ago, was architectural drafting. Everything comes around. After I climbed the tree and took some measurements I realized that in the end the sketch will indeed be only a sketch. So we began measuring and cutting and building. The platform would be placed just ten feet off the ground and resting on the main branch that stretches out to the South. The massive branch that protrudes from the side of the tree is itself two feet in diameter and could be a tree all of its own. It reminds me of John 15:5 where Jesus tells his disciples that we must abide in him as a branch is affixed to a vine. In fact, if we are not abiding in him, he goes on to say, we can do nothing. That massive limb on the side of my maple tree is doing some serious abiding in the main tree and because it is doing so it has become incredibly healthy and strong. Strong enough to hold up one big tree fort. After all, if you know me, I believe in doing things in epic proportions. But the question is pounding at the back of my skull like a jack hammer on old concrete. “Am I abiding in Christ?” “Am I that healthy?” “And if I am not that healthy, Why?” Well the answers lie in my actions and my hearts desires for the health of my Savior. The question would have to come back to, “Do I really believe abiding in Christ is worth it?” Because if I truly believed it was, I would abide. Can the movement of ministry here in Seattle be slow and unhealthy because I am not abiding as I could be? My prayer this week is that I rediscover Abiding and that the church I pastor, Epic Life Church, would discover the same things. How wonderful it would be if we all truly abide in Christ.